the holidays. His grandparents were also a steady influence: As the owners of legendary Drury Lane Theatre in Oakbrook, IL, they regularly hosted banquets requiring extensive food preparation and showed Van Lente what true hospitality is all about. The most inspiring person in Van Lente’s life, though, was his mom. Before she passed away in 2007, she always told him that he had the ability to do anything he wanted, but that nothing would be handed to him. He says she pushed him to work harder, not to worry about the small stuff, and to be a good person—philosophies he shares to his cooks today. Van Lente pursued his love of cooking after graduating from Chicago’s DePaul University with a B.A. in public communications. He went on to attain his culinary arts degree Kendall College in Chicago. His rise up the culinary ladder in the Windy City began at Landmark, a Boka Restaurant Group institution at which he started as prep cook before becoming sous chef. There, he worked closely with Landmark’s Chef Benjamin Browning. “He showed me that there is so much more to it than just the food you put on a plate every night,” he says. 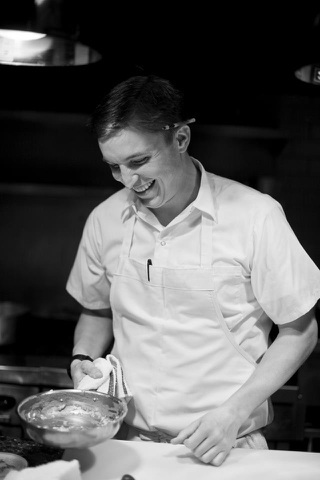 “He not only taught me how to cook, but how to maintain your sanity in this difficult and highly stressful business.” Van Lente also worked as chef de cuisine at Flatwater, followed by executive chef at Westend Bar and Grill, at which he worked for two memorable years before opening TWO. On his days off he enjoys cooking for his wife Shannon and playing with his two dogs, Piper and Mr. Bananas.